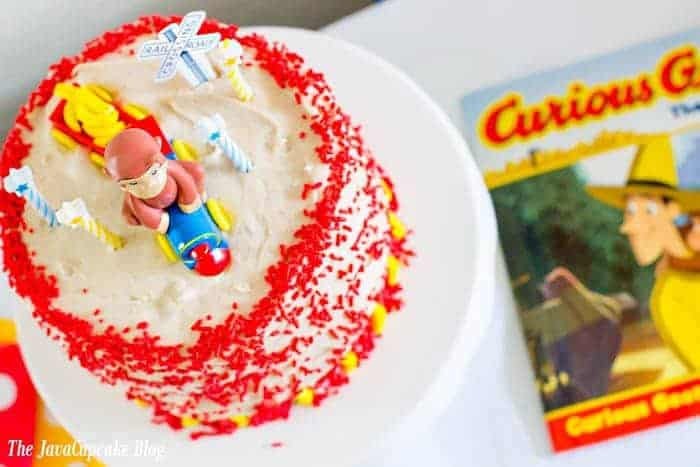 Create an inexpensive, colorful, and fun Curious George Party using these simple and creative ideas! 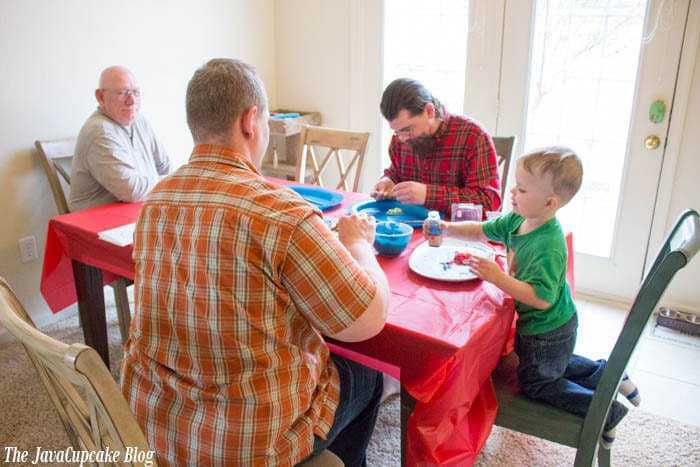 A month after my family moved from Germany to Virginia, my son turned 4 years old and I needed to put together a party for him. The party was only going to be family so the party didn’t have to be too elaborate, but I still wanted it to be special. I decided to create a dessert table as the focal point for the party. I covered the sideboard the eat-in kitchen area of my living room with a white table runner. Instead of completely covering the entire sideboard, the white create a neutral color to showcase everything that sat on top. 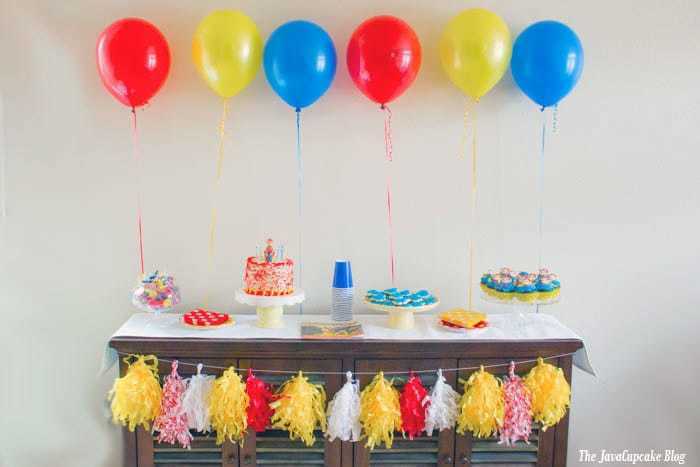 Since this is a Curious George Party, I chose to use primary colors in all my decor… red, yellow, and blue. I purchased inexpensive cake stands in yellow and white from Target and Home Goods and used a crystal cake stand I already had. Using pedestals creates height on the table and adds drama. Using balloons as a backdrop is one of my favorite ways to decorate. 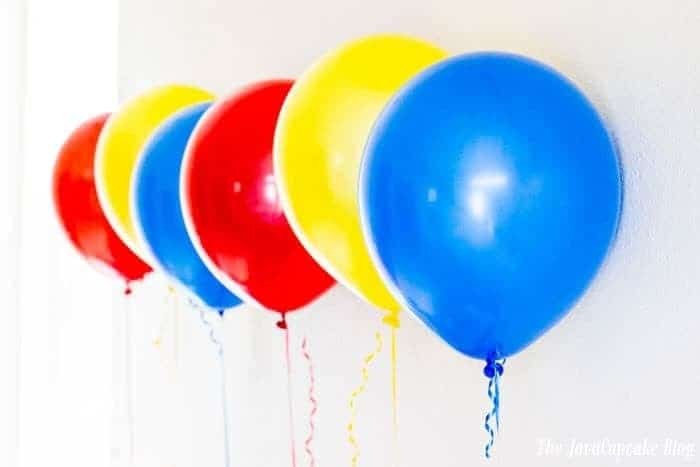 I had my husband run to the party store the morning of the party so the balloons would stay up all day. Placing them behind the sideboard created an easy, inexpensive, height-creating, dramatic look that tied all the colors of the party together. I already had these tissue tassels from earlier parties, so I strung the colors I wanted on bakers twine and hung it front of the sideboard. 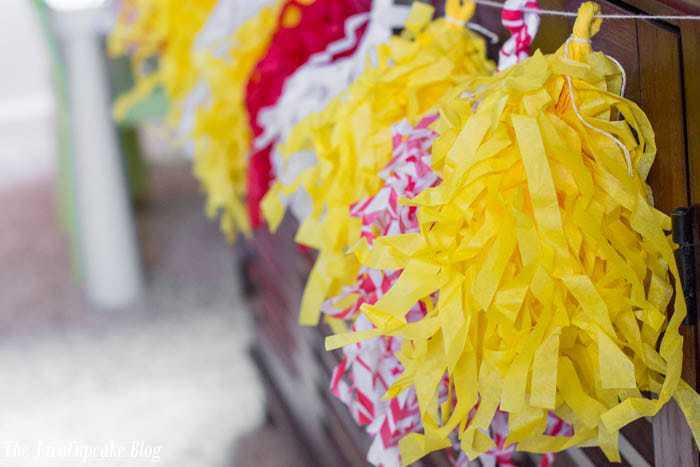 Party supply stores sell these premade as well as vendors on ETSY, so if you wanted to save yourself some time I’d suggest buying from there. Making tissue tassels is very time-consuming! Finally, I bought red and yellow paper plates and napkins from the party supply store and set them out on the sideboard to add more color. 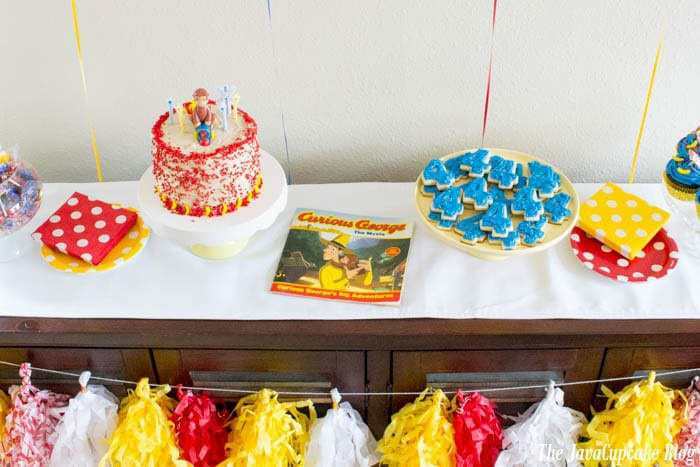 It also wouldn’t be a Curious George party without Curious George himself! So I placed a few of the books we had around the house and one on the side table! If you know anything about me, you know that I can never just make one dessert for a party. Ha! I always make at least two, usually three or four… regardless of how many people will be attending the party! 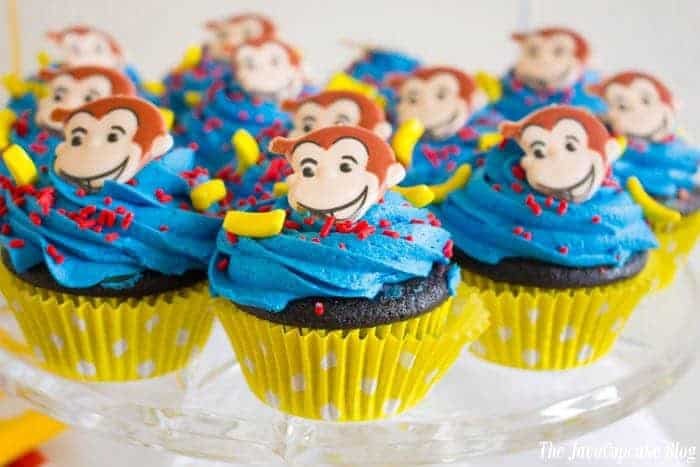 For Matty’s Curious George Party, I made these chocolate cupcakes with vanilla buttercream. Now since the flavors, which Matty requested, were basic I needed to make sure that the colors of the cupcakes matched the theme. For the liners, I used Sweets & Treats Boutique yellow dot #BakeBright grease-proof cupcake liners</a>. I topped the cupcakes with a blue buttercream, red jimmies and yellow banana candies. 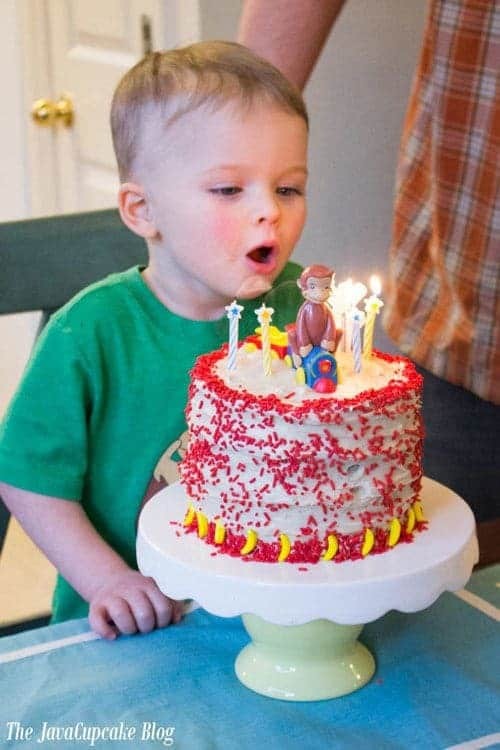 Matty picked out Curious George rings from the cake supply store and they brought the entire cupcake together on theme! The cake was a banana cake with brown sugar cinnamon cream cheese frosting. Not only did I have some ripe bananas on hand, the banana flavor paired perfectly with the Curious George theme. Monkeys love bananas! 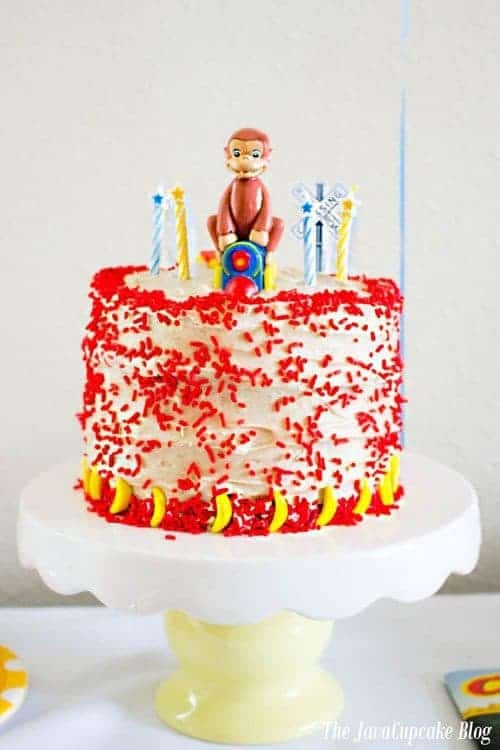 I topped the cake with Curious George on a train and filled the train car with banana candies. 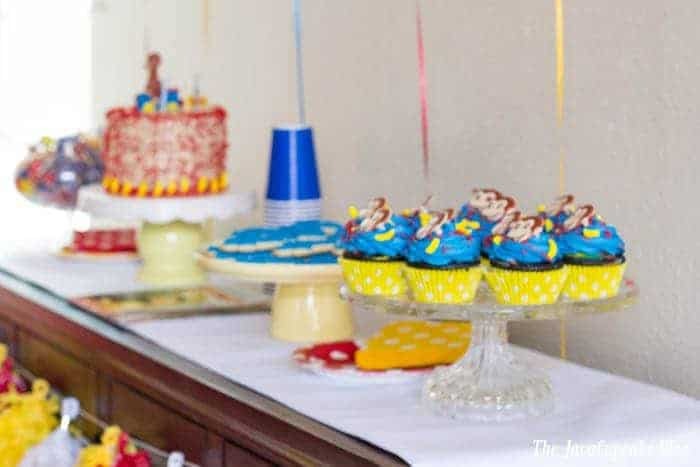 I carried over the red jimmies from the cupcakes on to the cake and displayed it all on the white and yellow stand. Everything is coordinating without being too matchy-matchy. For the cake, I baked Emme’s banana bread in two 6-in round cake pans. I sliced them in half creating four layers. I filled and topped the cake with brown sugar cinnamon cream cheese frosting. I used my pipeable cream cheese frosting recipe and subbed Philadelphia Brown Sugar & Cinnamon Cream Cheese for regular cream cheese and added 1 tsp cinnamon. It was DELICIOUS! I found a #4 cookie cutter at the cake supply store and made a single batch of my soft sugar cookies and frosted them with blue buttercream. 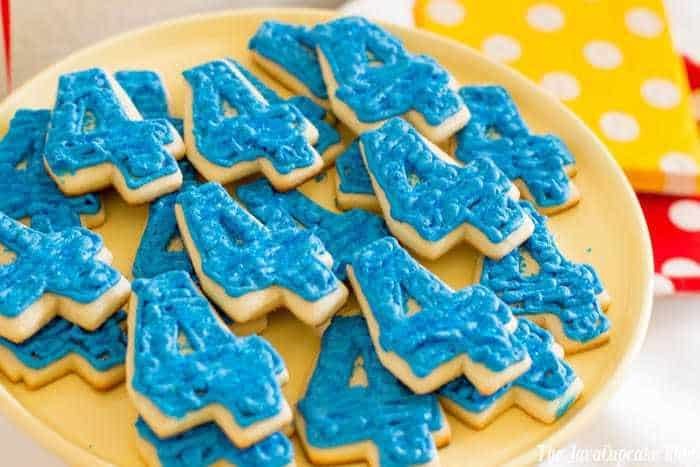 I love how cutting the cookies in a number 4 added a subtle, personalized touch to the party. 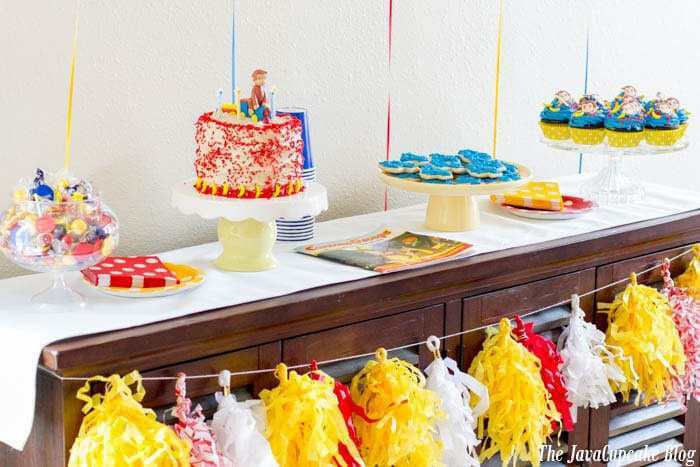 To add another dimension of fun to the dessert table, I purchased red, yellow and blue candies from the party supply store. 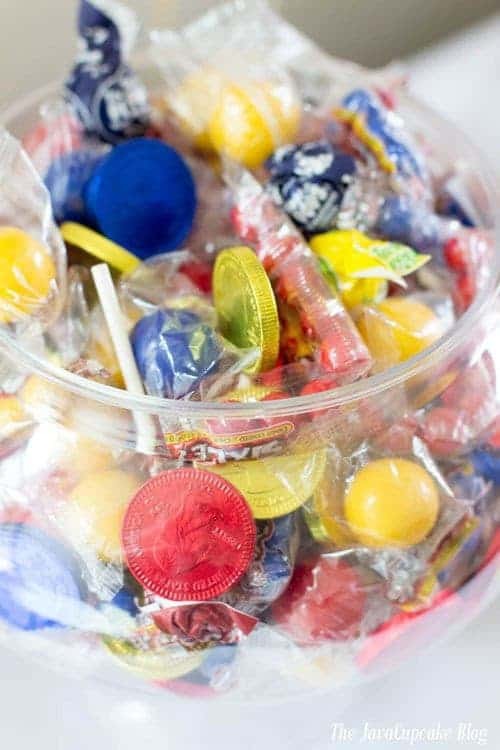 I displayed them in an inexpensive bowl but the impact of it was super cute and Matty loves getting a piece or two of candy from the bowl even after his party is over. 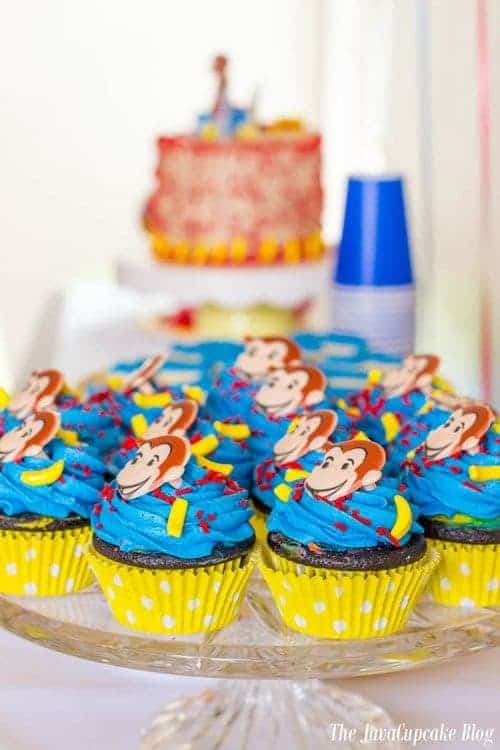 Matty picked the Curious George theme based on the cake and cupcake toppers he saw at the cake supply store. He really enjoyed watching me put it together for him in the days leading up to his party! I created a coordinating focal point using a second sideboard I had in the same room by covering it completely. I used an inexpensive disposable table cover and essentially wrapped it like a gift securing the extra behind the sideboard. 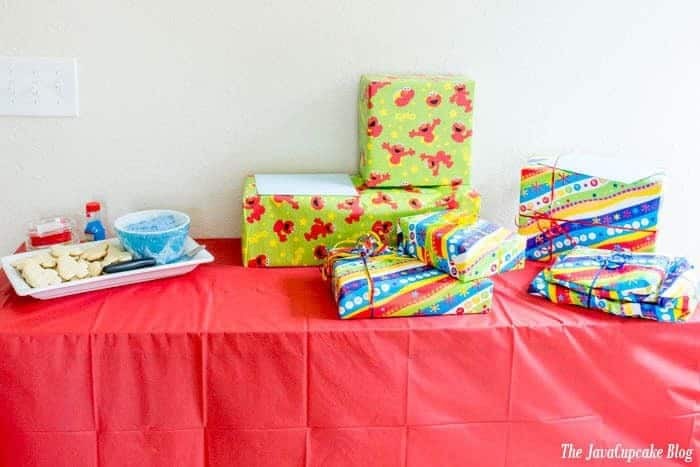 This area was used for displaying the gifts and it created a place to put the one activity I had planned. Speaking of party activities, since there was only going to be Matty at this party, I didn’t need to plan a bunch of activities. 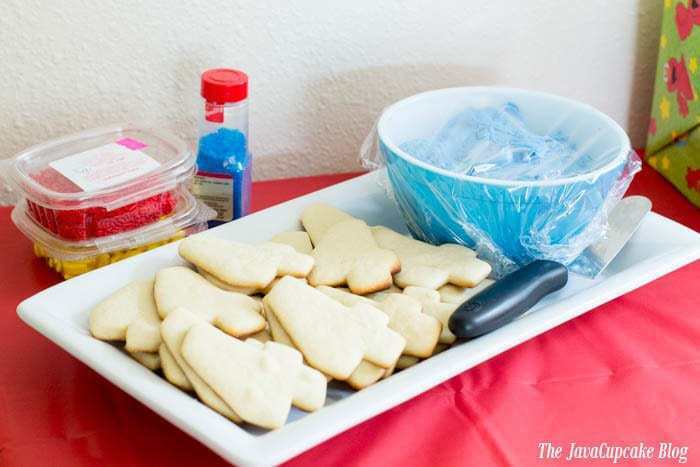 Instead, I simply left half of the number four sugar cookies unfrosted and set out the buttercream and toppings I used on the cupcakes with them for my guests to decorate themselves! I’m not sure who had more fun, Uncle Greg, Grandpa or Matty. It was a pretty special day for Matty. 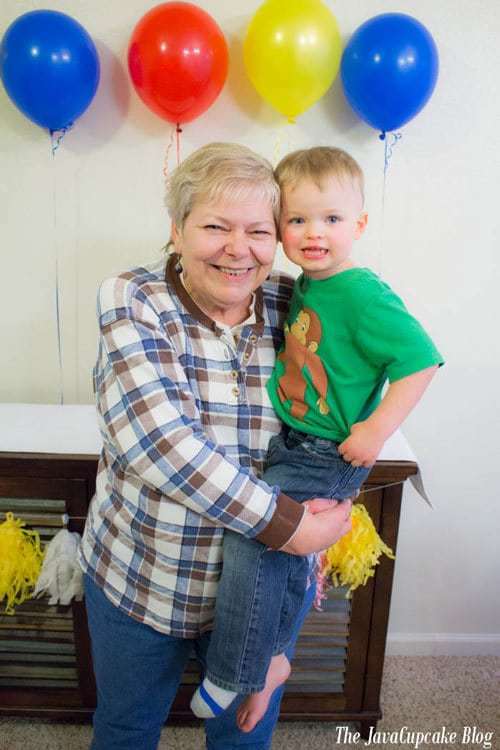 Not only was it his 4th birthday, but he met his Grandma Linda for the first time. 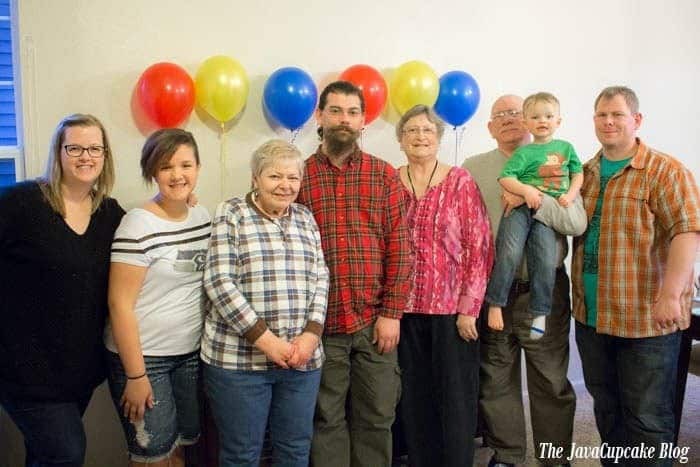 It was also the first time in 15 years that Dave’s side of the family was under the same roof. It was pretty amazing that son could bring them all together again. It was a very special day. Did I read that you moved to D.C.? I’m right up the road in Silver Spring, MD. I’m an avid baker, party planner and cook – just like you. AND i love your blog! Boy, do I have the cupcake bakery for you – Jenny’s Cupcakes in Kensington, situated right near frankly’s pizza (divine) and a fabulous by-locals craft shop very fun. Let me know if you go! I’ll meet you there. Hi Madeline! I moved to Northern Virginia, only 30 mins or so south of DC, at Fort Belvoir. I was actually in Bethesda yesterday… close to Silver Spring! I will totally have to check out Jenny’s! I love a good cupcake shop!! Thanks for telling me about it! What’s the name of the craft shop? That I do not know but it is right next door to Jenny’s! The chocolate cupcake with cookie dough frosting is definitely something I plan on making – possible tomorrow! !